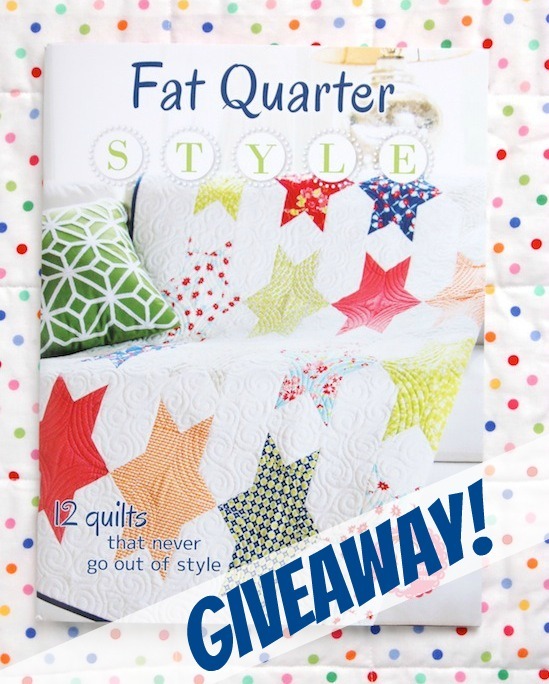 MessyJesse - a quilt blog by Jessie Fincham: Fat Quarter Style Book Giveaway! Fat Quarter Style Book Giveaway! Hello, hello! I'm back in today to share 'It's Sew Emma's' second book offering; Fat Quarter Style. Fat Quarter Shop have generously offered me a free copy for a lucky blog reader. I have a lot of wedding planning and 'secret' deadlines at the moment, so I don't have the time to make one of these fabulous quilts right now, but I for sure have 'Tapestry' (image above) on my list! I think this is my favourite pattern from the book. Wouldn't it look so great made up in some Bonnie & Camille fabrics!? April Showers collection, maybe? Oh, maybe even just one block and turn it into a mini quilt for my sewing room! ahh! Must.Resist. 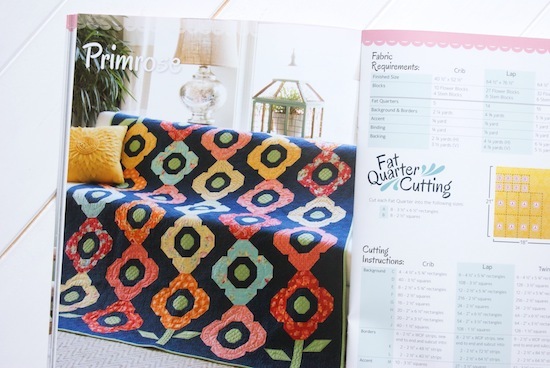 Talking of which, if you have either of Lori's books you will notice the same layout and instructions for making each pattern as they're brought to you by the same publishing house - It's Sew Emma / Fat Quarter Shop. So you can expect very, very clear instructions, diagrams and cutting information just like Lori's - which I completely love so this makes me very happy! Fat quarters are my favourite pre-cut size so it's great to have this book on hand and know I will definitely have the yardage required for a project. Wouldn't you love to have this on your bookshelf too? Yes? OK. Here's what you have to do. Drop me a comment on this post below telling me; what's your favourite pre-cut size? Examples: FQ, half-yard, charm pack, jelly roll, mini charm packs, layer cakes? This is open internationally, I'm willing to send anywhere! Competition will close Thursday 11th September and the winner will be announced on the blog Friday 12th September. I love all pre-cuts, but lately find I am buying FQ bundles. I follow you on Bloglovin and Instagram! I love all precuts too but my favorite might be layer cakes. Thanks for the chance to win! I've mostly used charm packs but I am liking the Candy Bars as well. I follow on Google Friend Connect which is where I read about the giveaway. Hi, would love o win tht great, looks fab! Favourite pre-cut is a Jelly roll, it's great for whipping up a quick baby quilt! Thx. I like charm packs the most, but I love them all! I love fat quarters the best. Thanks! All pre-cuts are great but I like the FQs! I tend to pick up fat quarters because that's usually what I can afford but then I sometimes regret having too little of a print to line bags or make a doll or pillowcase. Of course, that inspires creativity doesn't it?! Head says FQs or layer cakes because they tend to be better value but heart says mini charms because they are just so cute. Right now I'm loving charm packs, I can't beAr to cut into my larger size but these are already cut so I actually use them! Thanks for the chance! I love the Raindrops quilt! My favourite pre-cuts are fat quarters! They are versatile and useful for a lot of different things, from quilts to small pouches. Love them! Ooh this looks like a delightful book! I'm going to go with fat quarters as they are so versatile and reasonabley priced - I don't feel so bad when I buy lots! Have enjoyed following you on my Feedly blog reader and on Instagram too! I'm a fan of FQs. I buy mostly fat quarters. I follow you through bloglovin and get all your pics on Instagram. Fat quarters or jelly rolls. Fat quarters are definitely best value for money so they're my favorite! When I find fabrics I love in FQ I always pick them up even if I don't know what I'll use them for! I'm not on Bloglovin' or Instagram but I follow you on my feedly, hope that counts! I do love Fat Quarters because they offer so much fabric, but I usually get the charm packs for quick and easy projects, and less cutting! I like fatquarter bundles because there's enough fabric to play with to make either a bag or a quilt or clothing, but not so much that you have a on leftover cluttering your fabric bins. I tend to buy mostly fat quarters or charms. My favorite precuts are the precut fat quarters! They are so versatile and fit so perfectly with my other fabric stash. I usually will buy 1-2 of a pattern I am super fond of, then I will add to it with fabs from my stash. Eventually, I will have enough for a quilt or tabletopper. I just started following messy jesse on bloglovin! I have only been following your blog a few weeks. I love it. I would love to win the first quilting book I own from you. Hopefully it will help teach an old dog new tricks. I have been busy raising 8 kids. Now it's time for my interests. Great give away. Thank you for the chance. I tend to by 1/4 to 1/2 yards and fat quarters for the most part. I just started following you on bloglovin and Instagram. Love your blog! I get email updates too! I like all types of precuts! They make sewing up a fast quilt so easy! Fat quarters are my favorite with charm packs a close second. The book looks awesome!!!! HI, what a neat Book! Love Precuts and fat quarters are my favorite! I love both charm squares and layer cakes. I am a follower and enjoy reading your blog. I love fat quarters, since I usually don't know what I'm going to make beforehand. Thanks for the giveaway! I am a follower and I love your blog. I love a fat quarter. This book looks awesome! I like fat quarter bundles the best! I follow you via email notification. Thanks for the giveaway! Fat quarters are my preferred precuts. Thanks for the chance. I like all pre cuts, but think my faces at the moment would be fat quarters. Following you on Blog Lovin & Instagram. Oops! That should be faves! My favorite precut is still a charm pack! I prefer FQ's and charm packs, depending on if I want a little of an entire line or a bit more of just one or two fabrics. Fat Quarters are my favorite! I love to use jelly rolls for my bindings! Thank you for this lovely giveaway!! I love fat quarter bundles, but if I really love a fabric line, I go for the half yards. What a fabulous give away. I absolutely love charm packs. Love them all!!! but layer cakes and jelly rolls are my fav. Great book!! Fat quarters are my favourite. I follow you via Bloglovin. Fat Quarters are the key! Already following you on Bloglovin. Thanks so much for the chance. Love jelly rolls and layer cakes. Have made several drunkards path quilts with the layer cakes and many different quilts with the jelly rolls. I really like them all. I have patterns for each of them. I would love to be able to buy more FQ stacks but often have to be content with a FE stack. What a lovely book! 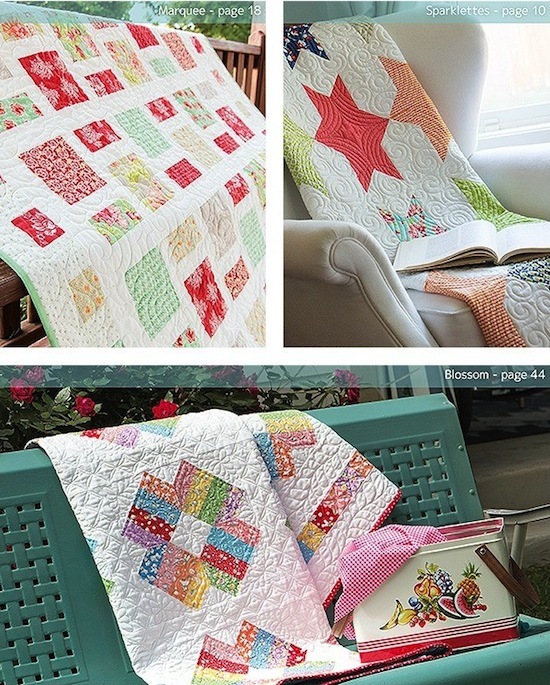 I always loved quilts with lots of white and happy colours! I tend to buy FQ - that is just the right amount of fabric - not to little and not so much you end up getting tired of the print! I love layercakes too - sometimes I cut them into charms, that way I think theres a little more seam allowance than if I buy charmpacks. I always sew the english way - paperpiecing - I have a sewing machine but I am not totally comfortable with it yet! Christine in Denmark - I LOVE your blog, by the way! Layer cakes are my favourite - they are so versatile! I love charm packs. They are affordable and you can use them for lots of things. Although I do own a LOT of fat quarters. They are good too but I don't really class them as a pre cut in my mind. Jelly rolls are very pretty to look at as well. Its so hard to choose!! I like fat quarters - there's enough to use for a decent sized project but not so much fabric that you get sick of it. I love the jelly rolls but honestly any pre cut as I don't have that much space. I like layer cakes. Yummy! I love fat quarters but I have some of all the pre-cuts. I too have my eye on making the Tapestry quilt, so pretty. Great giveaway! I love all precuts, but usually buy fat quarters because I can do so much with them. Thanks for the chance to win the book! Fat quarters are my number one favourite, especially when I purchase them in bundles, closely followed by charm packs. This book looks so cheerful!! I love them all....layer cakes seem to come in so handy along with half yards....but then jelly rolls rolled in first with charms.....so! !....you chooose!!!.....thanks!! I use fqs to make pouches, but like charm packs as well. My favourite pre-cuts are charm packs. The less cutting I have to do, the better :D.
I love jelly rolls as they're so cute! I love the versatility of fat quarter bundles, I love being able to have a variety of prints but still be able to have some wriggle room in quilt pattern selection. I like FQ's the best - they're versatile for things other than quilts too. I follow you on bloglovin. My favorite pre-cut size is 1/2 yard. I can do so many other things with 1/2 yard and have many "in stock" in my closet! 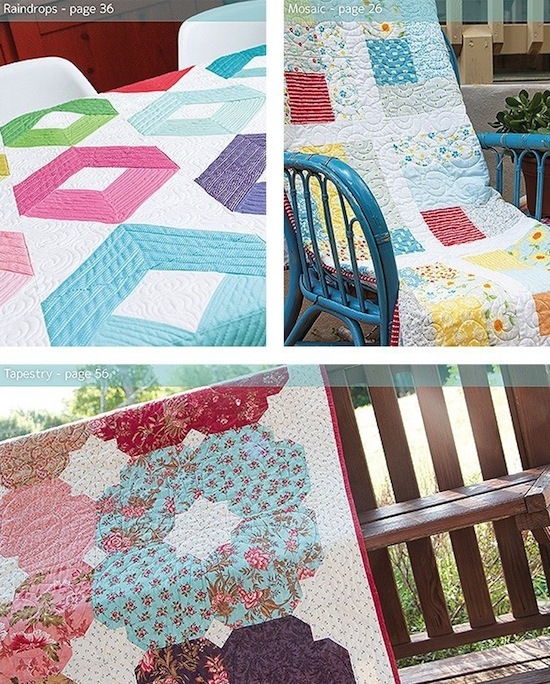 I looove the Raindrops quilt...so gorgeous! I would love to win a copy of your book because it would be a great 'go to' book for my precuts. My favorites are fat quarters because they are so versatile, and second I love charm packs as they are just perfect for table runners and baby quilts. Layer Cakes are my favorite, but they are all wonderful! Jelly rolls are the most fun to work with! I prefer fat quarters because I use them better. I follow you on bloglovin and Ig too. I love charm packs because they are easier to afford! Thanks for the chance to win! I prefer fat quarters as I make all sorts of things and the smaller precuts are a bit limited in use. Though I love a pile of precut squares for simple patch work. Fat quarters are a great way to get a taster of a fabric line too. I was always a charm pack girl, but lately my go to pre-cut is the layer cake. It is more versatile and shows off the larger prints. Usually you will have some leftovers to kick start a new project. You can cut 4 x 5 inch charm squares from each layer so it is actually more economical if you are prepared to do the work! I love all precuts but my favorite are charm paks!! I like pre cut 6" squares. I love Fat Quarter bundles. I always look at Jelly Rolls, but end up purchasing Fat Quarters. Thanks so much! I love them all,but like Fat Quaters alot! I like fat quarters best. Follow you on Bloglovin - clc408. I love fat quarters the best. I'm not sure. I've just started quilting and learning what everything is all about. So far I'm just into building my stash with yard cuts. I need to get fat quarters for my next project: a king sized Grandma's Garden done by hand using English Paper Piecing! I may just be insane!!! I like fat quarters. Very versatile. Anything smaller than a fat quarter and I worry that I won't have enough fabric to complete my quilt block correctly. I've recently purchased a couple of charm packs but am not sure how I'll use them yet. love all precuts! but FQ and jelly roll are my favourite! Just getting started not sure if I have a favorite yet. I don't have a favorite style and this is all sort of foreign to me. My Mom likes to make these, so I'd like to win the book for her.